The color. The flavor! The PUNCH. Make a big pitcher of this for your friends on Saturday afternoon because it’s summer and day drinking occasionally beats night drinking. Sun and fun, hello! Warning: there will be lots of exclamation points. Fresh blueberry puree is how we start this thang. And then we move on to… hibiscus syrup! Doesn’t that sound so wonderfully delicious and aromatic? Even if they do totally look like little octopi. My mom was over and took one look in that bowl and was all WHAT IS THAT OH MY GOSH WHY ARE YOU STEEPING SQUID. But I was making this most delicious ever margarita punch for YOU. I am a rocks girl through and through. I ordered my first margarita on the rocks when all of my friends wanted them frozen. I always wanted (and still want) tons of salt on the rim – coarse salt with occasional sugar is okay too – and my favorite thing is the tart flavor mixed with a touch of sweet. Frosty glasses and fruit in the drink is just a bonus. In this case, I made a salty hibiscus sugar for the rim. Can I eat it by the spoon without judgement? Or diabetes? If you’ve been following along with my margarita love over the last seven years, then you know that I also NEED Grand Marnier in my margaritas – always. I can immediately tell if I leave it out and just find that something is… missing. It’s not *too* orange-tasting and I find that it adds an almost rich flavor that brightens the drink. You can totally leave it out but I adore every aspect of this drink. Plus it’s pretty! I think that’s excuse enough to sip it. LIKE WE NEED AN EXCUSE. Place the hibiscus flowers in a bowl and pour the water over top. Let sit and steep for 30 minutes. While the flowers are steeping, place the blueberries and juice from 1 lime in a saucepan over low heat. Heat until the blueberries begin to burst and become liquidy and soft. Transfer the mixture to a food processor and blender and puree until smooth. Take the hibiscus water and place it in a saucepan over medium heat. Whisk in the sugar and bring the mixture to a simmer. Simmer for 2 minutes then remove from the heat and let cool to room temperature. 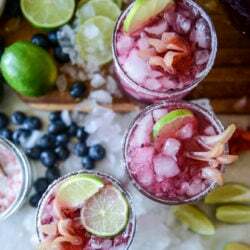 In a large pitcher, mix the tequila, grand marnier, lime juice, blueberry puree and half of the hibiscus syrup. At this point, taste the mixture and see if you’d like it sweeter – I like all of the syrup in mine, but make it your own! Rim each glass with a lime wedge and dunk it in the salty hibiscus sugar. Fill with crushed ice. 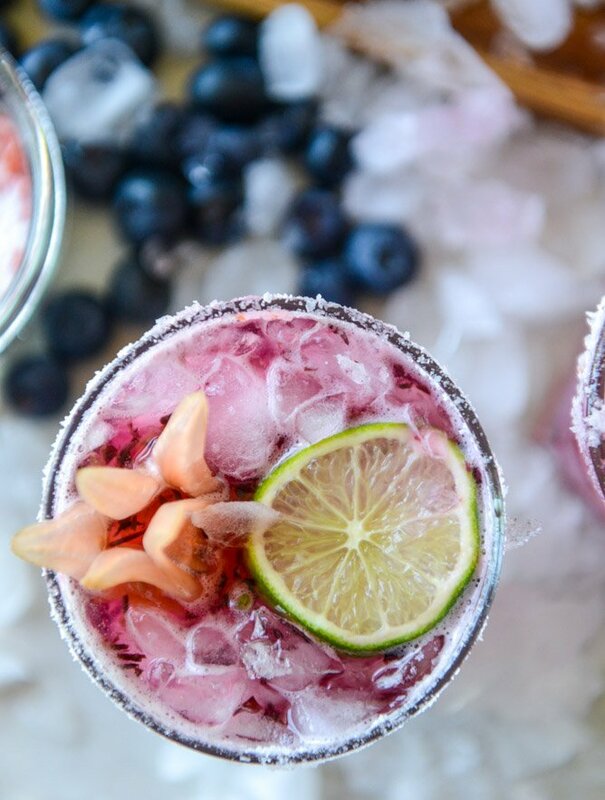 Pour the drink over the crushed ice and serve with extra lime wedges. Place the hibiscus flowers and sugar in the food processor and pulse until the hibiscus is in small crumbs. Pour the mixture onto a plate. Stir in the salt. Absolutely YES! Bring on all the exclamation points you want when it comes with drinks! These sound amazing, like the perfect combination of flavors. These are gorgeous AF! But I can totally see how your Mom thought you were steeping squid. Lol. Gross. I’m freaking out just thinking about that. Cheers to *almost* the weekend! haha right?! have a great one liz! rocks and salted rims for life! Wow this is so insanely pretty! I’m in love. Need to make this now. So, where do I buy dried hibiscus flowers? Pretty sure I’ve never seen them at TJ’s. Though, why the eff not? You can buy the flowers at any Mexican grocery..named jamaica and we use them daily to make agua de jamaica…just boil the flowers with water and strain, add sugar to taste. Oh Em Freaking Gee!! This is like an alcoholic version of the Berry Hibiscus Refreshers from Starbucks, which I am absolutely addicted to! Like I get one every day, sometimes twice. No shame in my game. Can’t wait to try this!! i love those things too. so good. When I first saw this post, I was like is this real life. I just have no other words than that. Wow, yinz done good! This looks amazing! Is there somewhere you can buy dried hibiscus flowers? Thanks to these photos and your description I am ready to get my “squid” on and in that soaking liquid and then down a glass or two or three! Where, may I ask, does one find dried hibiscus flowers? Would hibiscus tea or the like work for creating the flavor? I’m sad because I’m starting the Whole30 thing tomorrow and this isn’t on the list. Something to look forward to I guess. i think hibiscus tea could work! good luck on whole 30. i did it a few months after max was born and really loved it, actually felt incredible. however it made my milk supply suffer so i stopped 15 days in. it’s great though, i just wish you could eat beans on the program! Oh my goodness…YUM!! On a super hot day, I could probably drink 2 or 3 of these. They look so refreshing and delicious. I love your colors!! Thanks Jessica. This is amazing. As I am from cape town, temp is so high. So this is so good for me and my family. Looks yummy, going to ask the wife to give this a try over the weekend! … can’t wait!